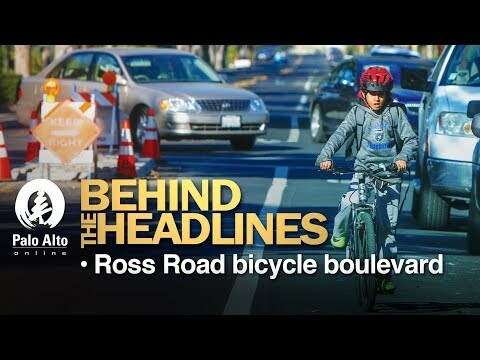 Behind the Headlines guest Chris Corrao, a city of Palo Alto senior transportation planner, explains the reasons behind street modifications on Ross Road to create a safer bicycle boulevard and how the various humps, bumps, concrete bulbouts and roundabouts improve traffic and bicycle safety. Watch the webcast here. Check out previous weeks' episodes here. Clarification to the comment from parent: many drivers are willing to sacrifice the safety OF OTHERS for more speed for themselves. Drivers are very often willing to do things that are dangerous to pedestrians and bicyclists if it doesn't present any danger to the driver. Man, Did the City Mess this up Royaly..
Wow, I watched the interview. I am amazed about how arrogant the city staff is about this project. Basically we are all too stupid to understand what they are doing. Our tax dollars get to support this. They did a terrible job getting buy in from the people most affected by this project, not just on Ross Road, but those in the surrounding neighborhoods. The whole outreach they did was to tell us about it, not to ask us if we wanted it to happen. If they really wanted people affected by what they were doing to understand it, they should have first painted lines where the construction would be, then ask for feedback. Lastly, these low concrete barriers are going to be a nightmare at night. Unless they are illuminated, there is going to be many accidents where people don't see them. I just read the article in the printed Weekly newspaper. An important piece of information was omitted: the budget assigned to this project, any additional employees added as a result of the project, and who approved the budget for this project - is it a result of stove-pipe projects which exist but are not compiled against other ongoing projects the city is performing or contemplating. This city has a budget at the top level which has to consider changes to Alma rail crossings which I think are more important. The management of a business or city is just that - a business which has to meet schedules, funding, manpower, and subcontract issues. The financials associated with need to be part of the notification process. Do not expect that the next "great idea" the city comes up with will be initiated before all of the business components are fully revealed. The bicycle coalition is a special interest group, as is the HSR group, homeless group, ABAG support group, and ECR revitalization group. How many other groups are out there competing for taxpayer funded project? It is time for the city to publish all of the on-going project and anticipated projects which require taxpayer funds. We are reading on a separate stream about the 101 bridge crossing and how the cost of same is inflated over what other cities have paid for their bridge crossings. This streams cost has not been provided - how much could the cost have gone to the 101 bridge crossing? California taxpayers need to wake up and start asking the right questions about how their city is being managed in comparison to neighboring cities who are also moving ahead full steam and have good financial data to back up what they are doing - cost and value. I just watched the guy from the city keep repeating the mantra "it's hard to know how these things are going to work" when A) they could have figured it out BEFORE wasting multi-millions of OUR dollars and B) paid attention to YEARS of residents' continuing complaints about other failed bike projects instead of cavalierly dismissing us. Here they are spending millions on something that is not tested and most likely will create new problems, as cars run into these new concrete islands at night. At the same time the city is cutting back on important departments such as the fire department. Recent events such as the Wine Country fires and Southern California fires show us that a city should be as prepared as possible. I regularly cycle on Ross Road. Considering that construction isn't even complete yet, how do we know how the changes will affect the neighborhood? Calm down everyone, this is all concrete that can be removed. I love the innovations. Anything that causes drivers to have to realize that there is something besides cars on the road is a good thing. This is a tertiary road anyway, so lets keep the speeds nice and low. Thanks City! I was at one of the meetings you held, long ago. You sent me a postcard, and I showed up. I participated. For those of you who are suprised by construction - pay attention to your mail. You may be interested! These "improvements" being brought to you by the same people who gave us the Paly / Town&Country intersection. And them it took them 8+ years to synchronize the unnecessary crosswalk light AND whether to shut it off entirely when there's no school -- like at midnight and weekends. Loved when Jaime put that RFP out for bid twice with a week's response deadline, the 2d time just before the Xmas holiday. I think they're STILL getting "stakeholder buy-in" from the County, Stanford and ??? on how/if/when to fix the ECR intersection and its lights. Update it regularly and keep dumping it our Planning and Transportation workers, consultants, commissioners, city manager and his staff, City Council members and all the other "stakeholders"
I drove home on Ross Rd after shopping at Midtown. It was scary with cars, bikes, and all the construction equipment and workers sharing the same space. It might be the cyclists' dream come true, and 'yes' it will be effective as far as I'm concerned, because I will avoid it and the possibility I might accidentally kill a person riding a bike or a pedestrian. Look for all the tire marks on those concrete structures in the future and possible law suits against the city. [Portion removed.] I don't see any beauty in cement barriers with river rocks. Bryant works as a bike boulevard because there are enough streets that physically block cars from going through. We obviously can't start blocking all the streets in Palo Alto to turn everything into a bike boulevard. This is a horrible idea, poorly designed, communicated, and executed. It's going to make the street ugly, residents who have to drive on the street (because they actually live in the neighborhood!) mad, and bicyclist unsafe. Please don't ruin Loma Verde either by adding these stupid "traffic calming" features. There's nothing calming about driving or cycling through a maze of confusing concrete protrusions. Didn't they remove the ugly giant cement pots in the green meadows neighborhood years ago because they were thought to be unsafe? Let's not repeat old failures. We recently had an evening guest who is familiar enough with the area but hasn't driven here for a few weeks. His comment was how hard to see and unexpected these hazards are for someone who wasn't aware they are there. It is going to take quite a while for those occasional drivers to become familiar with the obstacles. I am waiting for the first collision, accident, incident - whatever. I doubt very much it will be down to inattention on the part of the driver, just unfamiliarity with the conditions. As an example, if you are busy watching a group of young bikers you may not see the plant pots. There is such a thing as so much to watch for that you are blinded by something apparently obvious! Especially bad is all the thick paint markings on the street and extra signs. Excessive. Guess they think drivers can’t remember which side of the road to drive on go more than a second or two. It is one thing to paint and mark exceptions but is it necessary to have repeated paint and signs to mark the default rules? "It might be the cyclists' dream come true, and 'yes' it will be effective as far as I'm concerned, because I will avoid it"
Sounds like it is working as intended. C- is a registered user. Vote out all incumbents and start over. Why moan about our tax dollars, and then continue to vote in the same people who think it's ok to waste our collective money on their pet projects which do a disservice to all but a few who buy in to their utopian bike project. Let's not cast this as "bicyclists vs. drivers". Our family uses both, and this change is not helping either one. This is a disaster in the making, pure and simple, and the "bicycle mafia" did not win. No one wants this. It's pure arrogance and experimenting on tax dollars. "They are just concrete blocks and can be removed" - not everyone makes $150K+ from FB. The City should spend our money more wisely. The main problem with this project is that it addresses an imaginary problem. As I and others said when this was first proposed, and as some people said at the public meeting, Ross Road was always a perfectly fine place to ride a bicycle. This project will make it much worse in that regard, if only because it will inevitably push cyclists and cars closer together. Yes, some jerks do speed on Ross Road, just as they do on every other street in Palo Alto. Forcing everyone to drive at 15 mph with bikers a few inches away seems like a bad way to address speeding. I appreciate having the webcast and having some clarification on what the city and Mr. Corrao has developed. It would have been helpful to have much more coordination and outreach with the local residents it impacts most heavily well before all this construction started. I saw the road sign on Ross for x-number of weeks. I've asked my children and to stay off this road regardless of their mode of transportation. This project appears to be horribly mismanaged and I do not want it to continue. I use these avenues to drive, bike and walk. The schematics online do very little to explain the proposals. Additionally, I did see the mailers and assumed the city would add bike lanes and perhaps the green striping to increase biker safety as in other areas of the city. I won't assume again when it comes to how my tax dollars are spent. You've created more hazards for all users. It seems an incredible waste of hard-earned tax dollars and exposes the city to increased liability. I don't live around Ross and don't go there so no opinion on the "improvement". However the rivers of the green paint all over the city is quite ridiculous and ugly and absolutely unneeded. Who sold the city on this idea? And by the way we it makes the surface slick. Stop! You're right in my case, but I fear for the lives of others. Let the CC members who voted for this, and all the advocates, lead a bike parade the entire distance, with them in front, at around 3 PM on a school day. I feel compelled to speak up because I feel certain bad things will happen, and it will be borne out by comparing 'before' and 'after' accident reports filed on that stretch of Ross Rd. Of course my biggest fear is for the cyclists, the ones it's intended to benefit. They're most vulnerable. Let's not imperil the lives of our kids. And a serious suggestion: Car lights at night won't illuminate them well enough, especially in the rain. Install perimeter lights on all islands and other new concrete structures built for this crazy project. The only way you'll get a response from the CC members and/or the city officials responsible for our traffic ills if if they get bad publicity. They and the city officials like Mr. Mello who inflict this nonsense on us can't be bothered to come out in person and view what they've wrought. Remember the old Sen Proxmire "Golden Fleece" awards for silly and wasteful government spending? Maybe the folks who love to blame "progressives" for everything can contact the conservative media and get them on PA's case? For all of those praising the way Bryant is set up, you’d better take a look at what is coming for that bike route. They are planning the same kind of “improvements” for Bryan as they foisted off on the Ross Rd. neighborhood, concrete obstacles, green paint and all. It’s time to bring some common sense back to Palo Alto! A much more efficient and inexpensive way to achieve that commendable goal would be for all bicyclists to be legally required to have front and rear lights on at all times, just as car drivers are so required. A significant and growing percentage of car drivers now thoughtfully keep their headlights or running lights on even during daytime driving, in order to increase the visibility of their large vehicles to other drivers. But I observe that at least 2/3 of the riders of small vulnerable bicycles in this area either don't have lights or don't bother to use them, even and especially at night. Some of them use only a front light to improve their own front view, but don't have a rear light that would enable car drivers approaching them in the same lane to see them. The suicidal adult cyclists who do this are among those who do much of the complaining about uncaring car drivers on forums like this one, but it applies just as much to child cyclists. Every day I see elementary-school-age cyclists riding after dark with dark clothing, no lights, and not even a reflector. The parents who allow them to do that ought to be ashamed of themselves at a minimum, if not prosecuted and convicted for child endangerment. Those are the same parents who are presumably unaware that their kids show off by riding their bikes with no hands on the steering bar while at the edge of the bike lane, or ride home from school four-abreast with two in the bike lane and two jutting into the car lane. In fact, some of those same parents are probably among the recurrent complainers about immoral car drivers. I've seen the same thing. They should add others signs on Ross Road as well: "Enter at your own risk or at the risk of injuring someone else"! Thanks to the Weekly staff for taking the time to ask Mr. Corrao these questions. It is now apparent that the purpose of the project is to get twice as many people biking to work (doubling the city's 8.5% figure by 2020). I would like to know if the planning department feels that this project is on track to do that, given the ongoing concern and confusion of those who live on Ross Road. I'd also be interested in knowing if the City Council fully understood the magnitude of construction that they authorized, given that there were no photos in the lengthy packet they voted on in 2016. So much of this could have been avoided if the project team and bicycle advocates had done a better job describing the purpose and the project itself. I walk Ross road daily and I can tell you that the median work they have done at Corina makes it dangerous to even walk on the -sidewalk- there now, let alone ride a bike along the street. If that is not the correct one, perhaps someone has the correct url? I agree with Paul Goldstein. Thanks, neighbor! At the meetings, it was very clear that actual resident input was not desired. NO ONE in charge would listen to the alternate view point that this project was completely out-of-scale. As a resident of Ross Road whose family bikes and walks and drives on Ross all the time, this was not a broken road in need of fixing. It was a perfectly functional road for multiple uses. Install a couple simple speed bumps on either side of the YMCA and small speed problem would have been addressed. Also, watching this interview, supposedly another intention of this project is "beautification" and increased tree canopy for the street. Wow! Shouldn't the rest of Palo Alto be upset that Ross Road gets this special multi-million dollar treatment? I am a registered user; I couldn't log in for some reason. I have watched the interview and read the concerns noted in posts. The senior planner makes several references to Dutch design. I have not traveled to the Netherlands and do not know anything about their traffic management programs other than the country has a robust and effective railway system. To those who have spent time in the Netherlands: is there any comparability between Dutch reality and Palo Alto reality? If yes, does Dutch traffic flow well? Is it sensible that we are modeling our suburban bike boulevards and traffic calming after the Dutch system? Or is this another example of grad school theory gone awry? Under CEQA this is called a "public controversy" and if properly noticed would have required review by an environmental impact report. I can hear the condescending Staff response: it was dealt with previously either in the adoption of the Bike Master Plan or annually when the Capital Improvement Plan is appoved on the Consent Calendar... Many cities and special districts require construction projects of over one, two or five million dollars not dealt with specifically in prior environmental studies to be reviewed---something apparently not done here. Having driven Ross Road both before and after I pragmatically ask "why now?" Wouldn't the almost nine million dollars required be better spent reducing the unfunded City pension liability? Pragmatically, I would ask that the project risk assessment be published by the City, if one was done. As many others have noted this is, and will be a liability nightmare. I guess City Planning Staff didn't talk to the lawyers who defended the City on the recent bike/Van collision. Reality is being avoided in several ways here. Maybe Bill Ross and others can help us elevate this "public controversy" so it does some good because this arrogance has been going for way too long. @Meetings Schmeetings and Paul Goldstein, "... At the meetings, it was very clear that actual resident input was not desired. NO ONE in charge would listen to the alternate view point that this project was completely out-of-scale." We on Middlefield Road experienced the exact same reaction 3.5 years ago when we first met with Mr. Mello. He was obviously shocked at the huge and UNEXPECTED turnout by 70 furious residents who showed up ONLY because a neighbor walked door-to-door handing out info flyers about the scheduled meeting about which we'd been told nothing. While Mr. Mello lost his fight to turn Middlefield into a bike lane with no parking -- an idea rejected 15 or 20 years earlier when traffic was much lighter -- you could see how he really resented being questioned by the parents bike commissions, teachers and others, how surprised he was that people called him on the accuracy of his costly 3-models, etc. He refused to accept factual corrections or concede a single point! Now he simply stopped responding to ANY of our complaints. One of our more influential neighbors has publicly and repeatedly called him out on Next Door for failing to notify us about planned -- and now implemented -- projects. We need some answers from the city on all of these ridiculous and unwanted and unnecessary projects! We need some answers on how city employees get to ignore the huge number of complaints they're getting! So now that it is obvious this was a huge mistake, how do we rip it out and return it to the way it was before?